There are not many companies in the world that can claim to having had Barack Obama, JJ Abrams and Oprah Winfrey pop into their offices for a chat. But then not every company is Facebook. The social network has been pushing its Live show for a number of years now, where famous folk are interviewed in front of a select live audience and streamed to millions, and it has finally brought the format to the UK. The first show was this week, with singer Jessie J chosen to give proceedings a distinctly British flavour. But as Glenn Miller from Facebook explained to TechRadar, it doesn't matter where the live show is filmed it will always have global appeal. "As Facebook is such a global company, it's great to be able to help its European footprint in music," he told us. "It's important to be able to talk to the artists and come up with the best ways to promote them, whether it is Facebook Live or with sports figures like Andy Murray, doing Q&As on his Facebook page. "Doing something like Facebook Live means you get to see how passionate people are around the world. We see the fans in the UK get excited, then see the ones in Brazil getting excited and this spurs the artists on." One of the biggest allures for fans of those who appear on Facebook Live is the fact that it offers access to stars that would have been impossible a few short years ago. 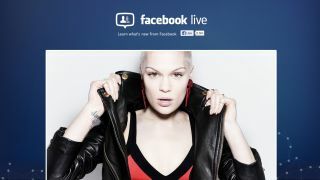 During the Jessie J event, for example, she answered questions posted on Facebook - and that's something Miller believes is one of the benefits of doing such an event through Facebook. "We allow artists to actually go on their Facebook page and hit reply to their fan questions. In their comments they can speak directly to them and that's great," said Miller. "You get to see the two-way interaction and once they fans see that they are really there, they want to ask more questions and then the acts want to spend more time on Facebook because they get to see in one clear post the amount of engagement from fans that want to participate in that moment." Being an open forum does mean that questioning your idols is incredibly popular. In one Q&A session Andy Murray did for Facebook, over 10,000 questions were asked in a few minutes, according to Miller, but it's up to the fans to make sure the right questions are answered. "The more engagement each question gets, the faster they will bubble their way to the top so it surfaces the best comments that the fans are leaving," explained Miller. Inevitably, you do get trolls. But as Miller notes, while the questions are not officially moderated, fans usually win out in the end. "Anyone can leave a comment, good or bad. But you quickly realise how powerful a fanbase is with the amount of positive and excitable comments that come out," Miller noted. "They outweigh any of the negatives that a troll might come and add - the fans are almost sub-moderating things themselves. They want to come and engage and have a place where the artists they look up to can engage too, so it ends up being a really good eco-system." Jessie J may be the first British act but there will be many more Live events in the UK, explained Miller, and while they may not all be music based, there is a reason why a lot of musicians have been asked to perform. "75% of the top 100 pages on Facebook are musicians, so musicians naturally use Facebook to be able to connect to their fans," said Miller. "There is no other place where you can get the largest distribution and reach to fans on a global perspective. I always say that Facebook is part of their DNA." To see Jessie J's live show and all the other performances, head over to Facebook Live now.